I LOVE a good coconut cake. What do I think a ‘good’ coconut cake is? It’s one that has a subtle coconut flavor, but not so much that it hits you over the head with it. 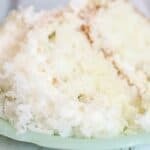 This coconut cake is a tender cake with a subtle coconut flavor. 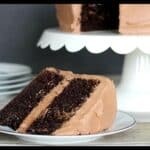 The sour cream buttercream adds just a slight tanginess, which is the perfect compliment for this cake. 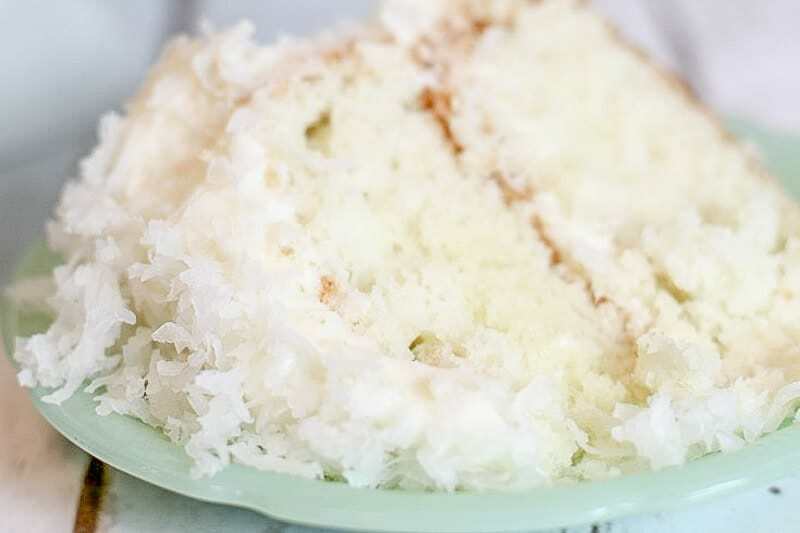 The great thing about this cake is that if you don’t like shredded coconut, you can leave it off completely. 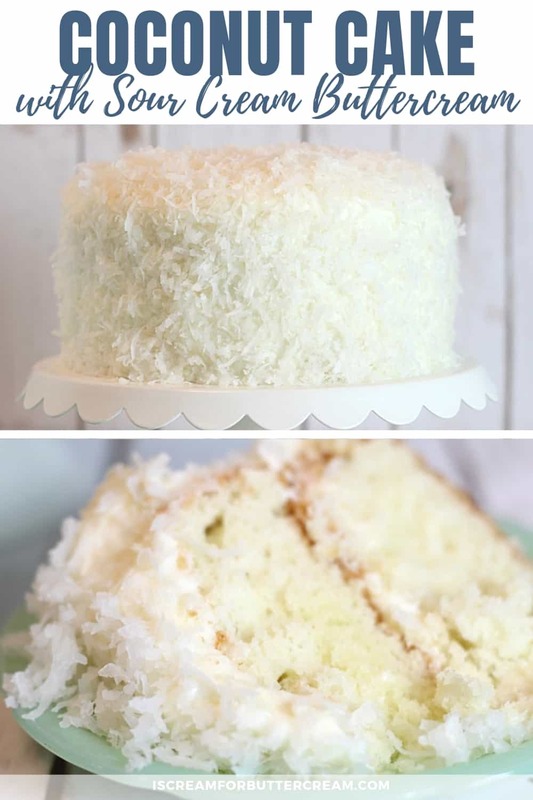 There’s no shredded coconut within the actual cake. All you get there is the flavor of coconut. 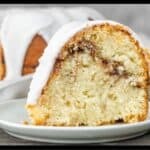 This cake is a butter cake, so the finished product is not a super white cake, but you get a richer, deeper flavor using butter and whole eggs. I also used cake flour instead of all purpose flour, which really makes it so much more tender. For this cake, I used vanilla bean paste, almond emulsion and coconut emulsion…all from Lorann oils. You should be able to replace these with extracts, but I just prefer the taste of the emulsions. I also used coconut milk for this recipe. I used Thai Kitchen Organic Coconut Milk that I found at my grocery store. Make sure you shake it up, or stir it before you use it. The icing on this cake is made with butter, confectioners sugar and sour cream. It’s got a slight tanginess to it, which really works well with the sweetness of the confectioners sugar. 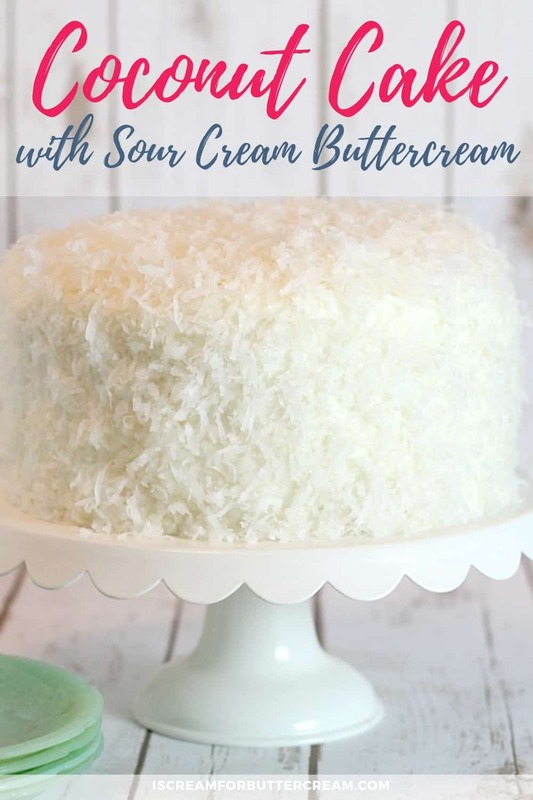 I LOVE this buttercream, especially when combined with coconut cake. It is a soft icing and you’re going to want to refrigerate the cake if you go with this buttercream. 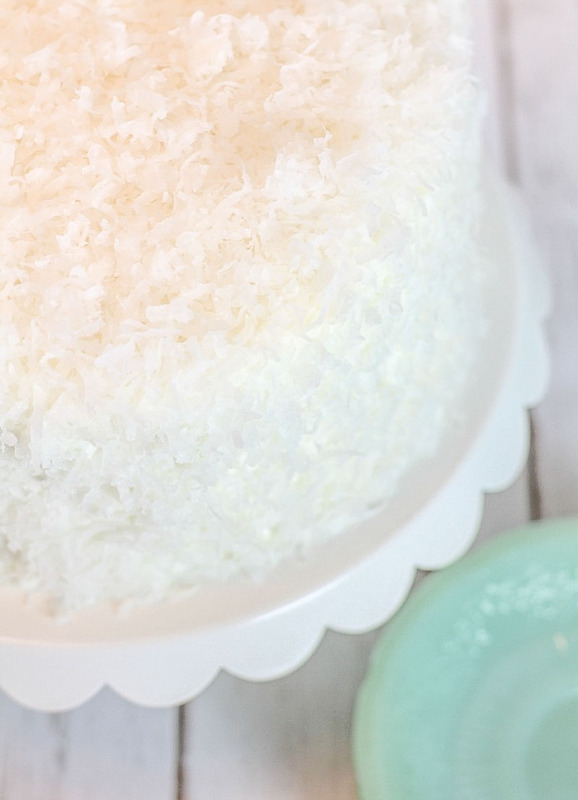 Once you’ve iced the cake, you can take handfuls of sweetened shredded coconut and press onto the sides and top of your cake. If you’re not a fan of shredded coconut, you can leave it off and it will still be great. When you get ready to serve this, take it out of the fridge and let it come to near room temperature before you cut it. The buttercream and cake will harden a bit in the fridge, so you’ll want it to be a little softer for serving. 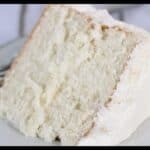 Following is the cake recipe and below that, the sour cream buttercream recipe. Enjoy! 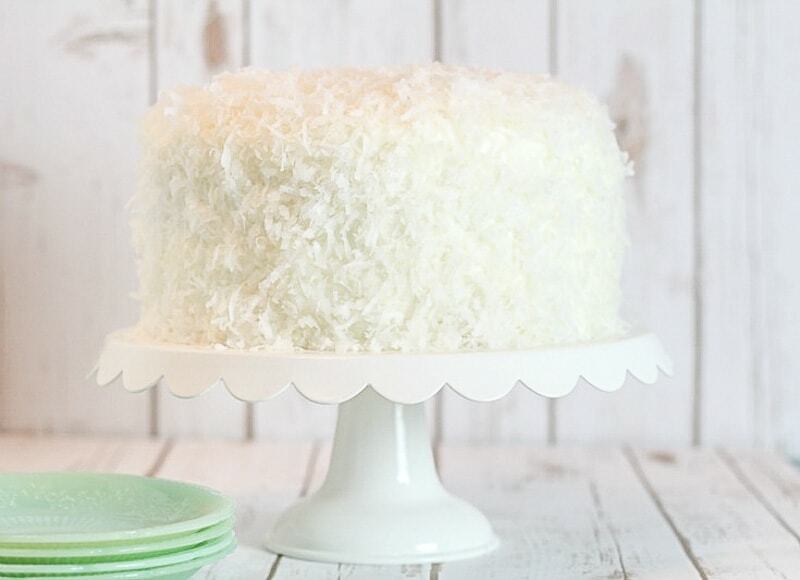 This coconut cake is a tender cake with a subtle coconut flavor. Frosting with sour cream buttercream adds just a slight tanginess, which is the perfect compliment for this cake. Grease and flour two 8" round pans. Cream the butter on low until creamy. Add the sugar and beat on low until mixed, then beat on medium until fluffy. About a minute and a half to two minutes. Add in the eggs, one at a time, mixing on low after each just until combined. Scrape down the bowl and mix again just for another 5 to 10 seconds. In another bowl, mix the cake flour, baking powder and salt. Whisk together to combine. Add the dry and wet ingredients alternately to the butter/sugar mixture. Mix on low. Start with a third of the dry ingredients and mix just until combined. Add in half of the wet ingredients and mix just until combined. Add another third of the flour mixture. Continue on ending with the flour mixture and only beating just until combined after each addition. Scrape down the bowl and mix on medium for only about 10 seconds. Pour into prepared pans and bake at 350 for about 30 - 40 minutes. Nutritional values do not include icing. This buttercream is made with real butter, confectioners sugar and sour cream. It's got a slight tanginess to it, which really works well combined with the sweetness of confectioners sugar. 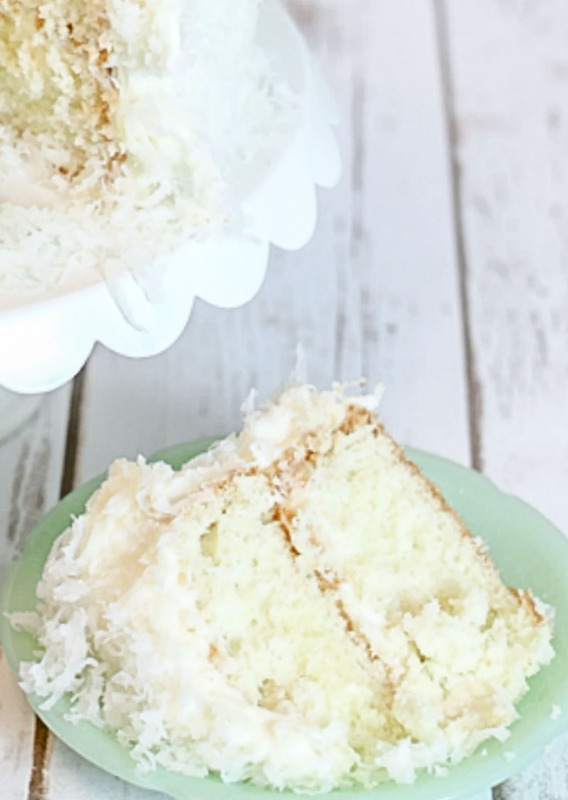 This buttercream is amazing when combined with coconut cake. It is a soft icing and since it's made with sour cream, it'll need to be stored in the refrigerator. Add in sour cream and beat until smooth. Add in half the confectioners sugar and beat until mixed. You don't want to add any milk or cream at this point. Once it's fully mixed, it won't be thick. Now, go ahead and add in the second half and mix well. Add in the vanilla paste or extract and mix. Refrigerate this buttercream for about 10 to 15 minutes to let it firm up a bit before icing your cake. This buttercream is a soft buttercream because of the added sour cream. You shouldn't need to add any milk or cream when making this icing. 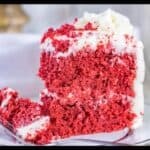 If the icing is still not as firm as you would like, you can add another cup of confectioners sugar and chilling it in the refrigerator will help it firm up a bit. Keep this buttercream stored in the refrigerator. Once you've iced your cake, you'll need to serve it immediately, or keep the cake, covered, in the refrigerator. Just made this cake today. Omg soooooo good!!!!!! Just Devine!!! Lara, that’s awesome to hear! And I have to agree with you…it’s one of my absolute favorite cakes. I made this cake and it was so good, with the perfect amount of coconut flavor. My only complaint was that there were a few wierd stringy bits in the cake which I think came when I added the eggs to the butter and sugar, even though my eggs and butter were at room temp. Any idea why that could be? So glad you liked the cake! I don’t know what could have made the stringy bits though. That’s kind of strange, huh. The only thing I can think of is sometimes if cake batter is mixed just a little too long, it can get gluey like streaks throughout the cake, but I’m not sure that’s what you’re talking about. That’s a real mystery! Hi the cake looks delicious as is. I am looking to make a lemon coconut cake. Can fill the cake with lemon curd and use the sour cream as icing”? Oh yeah, lemon curd would be really good with this cake. 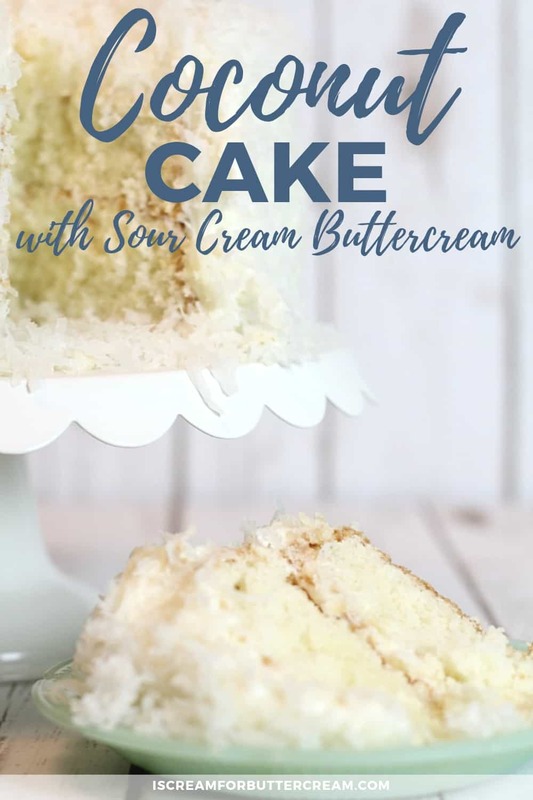 You could still use the sour cream as just the outside icing, or you could even go with cream cheese buttercream, or 7 minute frosting if you want a less sweet option. I would keep the cake good and chilled though, since both the filling and the icing will be on the soft side. I did your coconut cake with a few variations as we discussed. I filled and topped it off with lemon curd. Then used the cream cheese buttercream icing. Covered sides with sweet coconut. Besides it looking good the guests were raving. I’m must say I’m not a big coconut fan but it was delicious. Oh good! I’m so glad it turned out well! I’m definitely going to try it with the lemon curd. Sounds so good! You are a life-saver, can I just say! !